To much of a blow to go. Its been another cold and strong north west blowy week. Ric and I got a window and dropped eels with no action. Damien and I drove over and decided it was unfishable in the 25mph winds. If you think its cold here, I got an email from Johan Svenson from Norway. 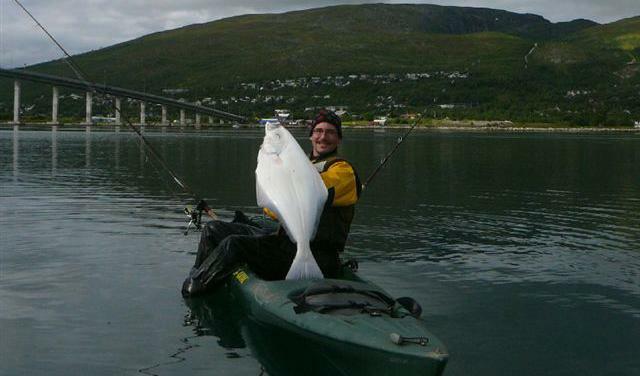 He kayak fishes above the Artic circle and lands some crazy fish. 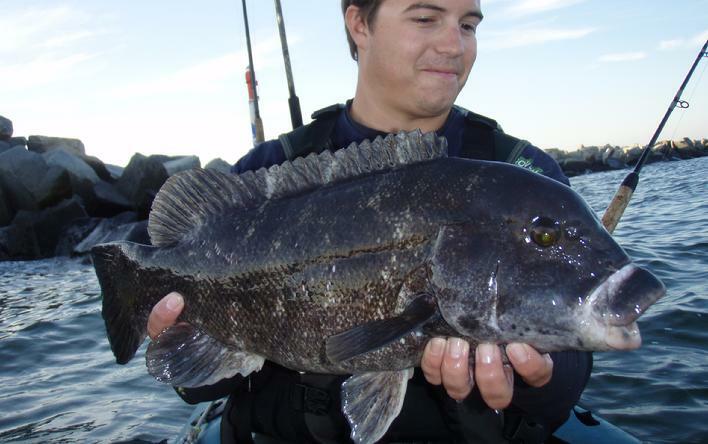 Check out his wolf fish and halibut below. Its cool to see what Johan lands on the other side of the world and in a really cold environment. You dont want to lip a wolf fish. But I hear they are good eating. More reds in the rain. Another blowy week and a rainy weekend. 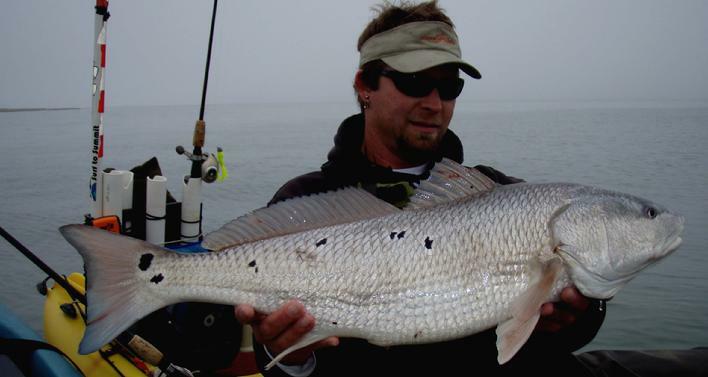 With only one window to put a full day in we decided on the fun stuff of the e-shore reds over the frustrating togs. 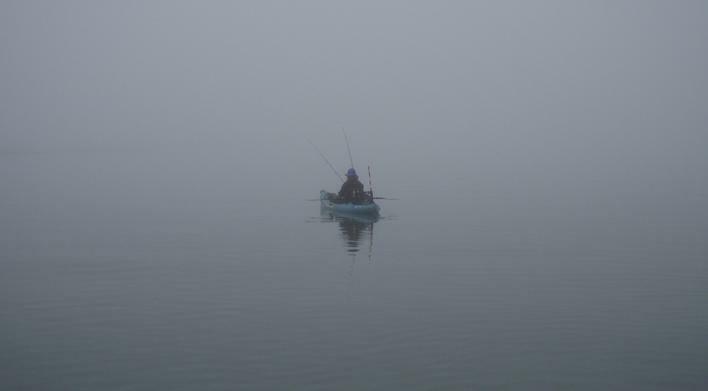 The fog was super thick on the paddle out to the island, we had to rely on our compasses with the visibility only at 100 yards. It was a little eerie. We knew it would rain by the early afternoon so we were prepared with our rain gear. Once we got close to land the fog thinned out. Lee was casting on the full moon flooded marsh grass and landed a 18�er, I paddled around to a creek mouth and was rigging up, when i looked up there was a huge boil like a paddle wash right in front of me. I pitched to it and my line cane tight and ripped through the water. Lee was paddling up from behind yelling, � you aint got nuthen!� but I had something, a tough 30�er in 3 foot of water. After that bit of excitement, it was slow going. We had to hunt for them way up into the creek. Once the water began to drain out, they came out into the drop offs to feed, where we intercepted them. For the entire outgoing tide we hit�em and moved as they did, till we were get�em on every cast. We all caught dozens from 17� to 23� on average. Hot rod Lee and reds in the rain. The wind stopped blowing on time again this week and Lee, Damien and I jumped out to the 1st island for some tog. We sat on the pilling for the slack tide and lee catches a small triggerfish. He moved to the spine, Damien and I hit more pilling with not a hit, but lee was getting into�em . we get out there and dint get a hit. The current was strong so we all moved to the island. Lee continued to hook up right between Damien and me. As lee rubbed it in we tossed oystertoads into his hot spot. �There ya go, catch those!� Lee landed a half dozen including a 21�er to Damien and my zero tog�s. I decided to go to the e-shore for some solitude and some togs. The wind was wrong for the ships so I thought I might look for some reds. The water was muddy; I figured clearer water would come in with the tide. I paddled around to a creek mouth and found some slightly clear water and stood up. I saw what I was looking for, a big sand boil from a startled red. I cast in the general direction of the sand clouds and immediately hooked up to a 29�er. 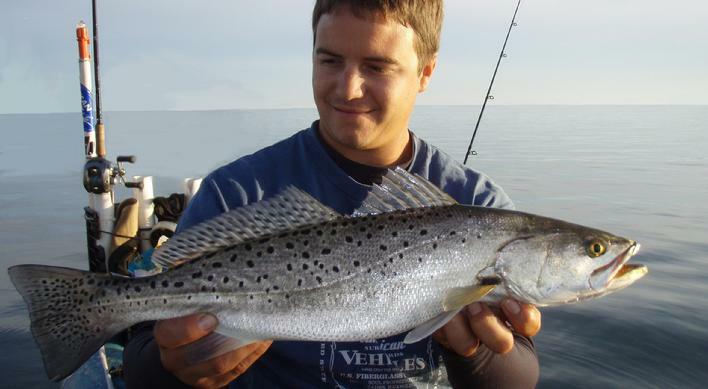 I stood in the ankle deep water over a sand bar tagged him, got some shots and released�em. While I was standing there I made another cast, as soon as it hit the water it was in a reds mouth. I steeped into my boat and went for another ride. I saw one in a foot of water rolling on very small bait, I cast my gulp at him and said, �You don�t want those little things, you want some of this.� and hooked into the 26�er. I stayed on them throughout the afternoon rains, tagging and releasing 43 reds total. 27 of them were between 16� to 19� and 16 of them in the 24� to 29� range. Tog'en at the 1st island. The winds dropped right in time to get to the 1st island for some togs. Lee, Damien and I paddled out and set up on the rocks. I had the spot and was the hot rod of the day landing a dozen or so, all nice size averaging 16” to 18”. I even caught a few small black drum, and we got into a full blown striper blitz by the 1st small boat channel. Back out the next day. I set up on the pilings for the morning slack tide. I caught a few and had a solid hit. The next one buried my rod tip into the water and my line was around the pilling. Once the line is on the pile, there’s no getting the fish to come back out with force. Any tension will snap the line on the millions of sharp edges. The only chance is putting the reel in free spool and follow the fish around the pile. There’s a chance he will shake the hook but he’s going to break if not attempted. I got around the pile and gingerly worked the 21” tog out of its hole. We fished all around the island with a few hits here and there. Back on the pilings at slack tide, John was in a hole and was consistently pulling in tog. The day before john was in that striper blitz with a jig-head but no tail. He cut a piece of his anchor rope and fashioned an improvised buck tail witch hooked a 35” striper. At the pilings I hooked into a citation size tog. Some times big tog will come nearly up to the top before bull dogging down. I pulled it wobbling half way up before it yanked me into the pile and broke off. It was to quick to react. I was shook up for a while. Little island bird paid a visit. Lee and I had one day to get out of the wind this week. 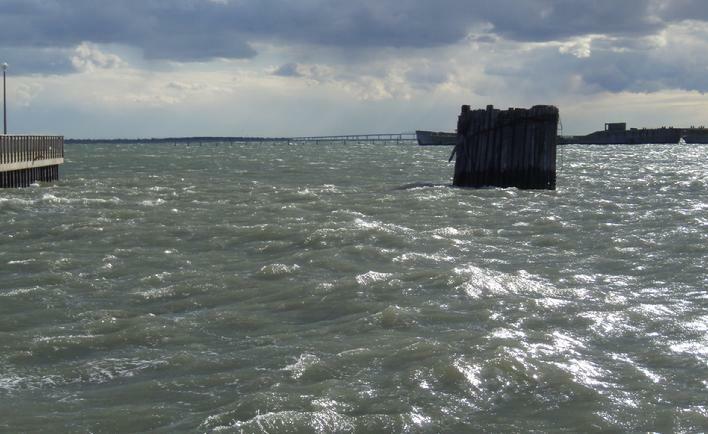 I have been watching the water temps on the eastern shore. Later in the week, it dipped below 60 degrees. It was time for some tog'en. In the last three years we have gotten on'em with the temps are in the 50's. I saw the buoy report and it was time to go. Two minutes after setting up Lee's got one on, then another. I was missing and feeding them. Lee caught 7 in the first 40 min. 7 to my one, but I caught up after moving near Lee's spot. The togs were hungry and we landed 20 to 30 between the two of us. Usually we get a smaller class overall, but they were a size up this time, with a lot 16 to 18". We also had two baby sheepshead, in 56 degree water. I had a nice surprise on the inshore fish this week. I was casting gulp with my speck rod, and I felt a 'THUMP' something heavy was on the end. I had tighten my drag, but not to tight for my 15lb leader. I was anchored and a friend of mine Paul on his boat 'Changes made' was down current from me. The fish was running steady for his anchor rope. I dropped my rope and winched up to the fish. I thought I had a ray with the steady pull. I felt head shakes but thought I had the ray in the wing. I almost had it in view then it ran deep. I was still fighting it light not knowing was I had. Then I got over the stand off and put the pressure on. I wanted to see this ray before I break it off. With the full pressure I got a full spinning fight and it was no ray but a 33" beautiful red. If you can get out between the fall wind, the fishery is on. I hope you can get out and GET ON'EM. kev. This weeks surprise, 33" red. Lee and I took an opportunity to get out to sandbridge before the blow. Lee cast netted some menhaden the previous day. The only thing between us and possible big reds was the chest high swells. We timed our surf zone sprint through the rip current channel. Lee made it with one peaked wave that almost got him wet. I took two straight to the face. We set up and bobbed out of each others sight in the troughs of the swells. After getting the shots at Lees boat, I sprinted back to my anchor, tagged and got the fish back in the water. He kicked away strong after a few minutes boga griped into the current. I just cast the second bait out when the first one took off screaming. I tighten the hook in and dropped anchor to free float fight. The fight was strong and I was soon wrapped twice in my other line. I cut it then got into Lees line, but the fight was almost over and untangling Lees rig was easy when I landed the 44"er. An hour later I was reeling the bait into position and felt a thump. I reeled it tight as it ran to my stern and under the anchor rope which a immediately dropped loose. And again it spun me toward Lee. This one the 48". We ran out of bait and was suppose to meet up with Capt. Reese in the afternoon. We came in for a landing at 1pm. I caught the best wave I have ever rode, all the way to a sudden stop on the sand. The trip with the Reese fell though so Lee and I wanted to go back out. We bummed some bait from the pier guys Angel, Eric and Shooter from Shooters Custom Racks. We launched again and I caught 5 more waves to the face. We both had no runs for the afternoon. Lee, Damien and I paddled off of sandbridge on a calm sea on Friday. The wind quickly picked up and was blowing 20mph by <?xml:namespace prefix = st1 ns = "urn:schemas-microsoft-com:office:smarttags" />11am. We packed all of our gear we didn't want to lose inside our hulls and paddled back to the beach. We all knew the chop on the water was going to hinder reading the swell in the break zone. Lee mentioned that one of us was getting wet. I paddled up the beach a bit to a slew I saw as we launched. Lee and Damien were over the bar. Lee got caught between the tight breakers and couldn't back out of it. His nose dug in and he was flipped in the water. I looked over after I was past the outside breakers as Lee was righting his boat and hopped in. Everything was in his hull so nothing was lost and we were all laughing hard. We saw his anchor buoy in the surf zone and relized it was attached to his anchor. We egged him on to go get it. "Come on man, your already wet, might as well get your anchor." And ,"Get back out there, I don't have any pictures for the report this week." He paddled out as Damien and I cheered him on. He recovered his anchor and another wave hit him broad side as Damien and I held our breath. Lee was so close to going over he was laying back all the way on his boat and recovered. He rode a breaker in and jumped off in the shore break. It was the most fun I have had after getting skunked. Shante and I went to the HRBT for some stripers in the light line this week. We hunted the line and found a concentration of them out toward the middle of the bridge. It was incredibly tough to accurately cast to the stripers with the hundreds of fast blues grabbing my lure before I could pull it in front of the striper. But they were there, we managed to land a few before we ran out of plastic baits. Lee jumping out in the shore break on his second time in. We have wanted to get on the second season of the reds as they migrate out of the bay. We were either going to the shoals or the infamous Sandbridge. The swells calmed down for an easy surf launch so Sandbridge was the destination. Lee and I paddled out and set up on an area that held a lot of bait flickering around. We soaked mullet on the bottom and waited for the screaming run of a red. My rod was the first to scream. Half way through the fight when he ran down, I realized that I have never fought a big red in deep water. On the shoals the fight is in six or less feet of water, the fight is faster and horizontal. Lee hooked up about two hours later. The fall fish are so much fatter and heftier than the spring time reds. The next day Zach and I paddled out a little later. Damien showed up way later. Zach and I set up closer in from. We all hooked up. At first we thought we were using the wrong bait, mullet. Damien landed his on a live crab! I can see if we were tog fishing and someone is nailing them in a hole, but out in the ocean with all of us around him, he was just on them. It was amazing! The first one of the weekend, a 46"er. Zach reaching for the leader. Damien's first big red. A citation earning 46"er. Another week of north-east wind and the TKAA tourney. This week again was nailed by heavy north east winds, 30 to 40 mph on Wednesday. The day before the TKAA tournament the wind died down to 10 to 15 mph, still windy but just fishable. I was real surprised the water wasn't pure mud, in fact it was clear in spite of the weeks turbulence. The water had chilled to 68 degrees and the little reds were turned on. I even managed to get a 17" speck. Tourney day, the winds dropped completely out. Ric got off of his boat to fish the tourney, its been months since I fished with Ric. He landed a 17" speck before I got out to him. The bite was slow in the morning, I was jigging in a area that can produce nice reds, I hooked up. It was heavy but not real strong, I thought it was a red although it didn't scream off like one. I saw its back and thought it was a 30" red, a would be contender for biggest in the tourney. A few moments later, I saw it was a striper and I was disappointed, "oh it just a striper." I forgot that stripers were a targeted species. I quit fighting him gingerly and started yanking him in. Then it hit me, stripers are part of the tourney and the fish was important again. I landed and measured the fish out to 31" total length, it registered 29" fork length. It held to put me into first place for largest striper. The bite turned on after noon and Ric caught a 19" red and a few more up to 18". I got into a dozen 12" specks and as many little reds. I stuck 25 tags over all. At low tide the water cleared to 5 to 6 foot viability. We stood looking to do some sight casting. Ric saw a red pass and pitched behind him. I watched his jig and the red speed out of the darkness and slam his jig. We hunted around for a sizable flounder so Ric could get a slam, but never found one. The TKAA tournament was top notch, super organized and ran professionally. Special thanks to Wayne Bradby as tourney organizer for a job well done! Check out TKAA for the results. TKAA tourny, Bigger and Bigger every year, nearly 150 kayak anglers.